A COLLECTION of letterpress printing advice from a man uniquely positioned to give it, Phil Ambrosi who ran Ambrosi Printers in Regina, Saskatchewan, Canada. See the Related Pages menu for articles, if you have a question for Phil, please leave a comment. 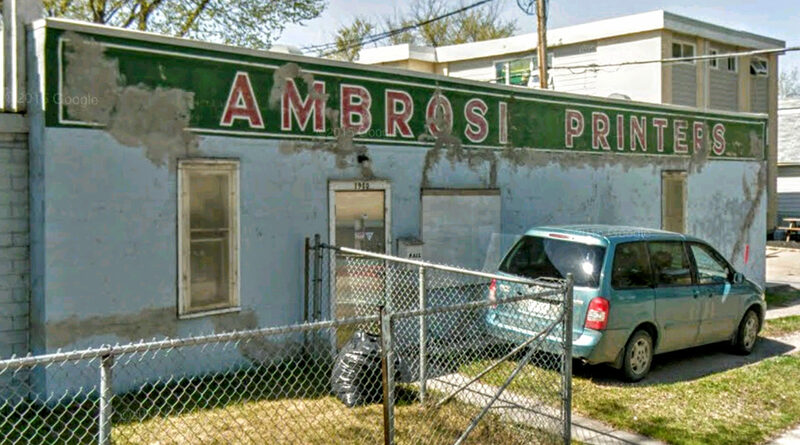 Ambrosi Printers, 1980 Montreal St, Regina, SK, Canada (Now closed). Image by Google. Here’s Phil’s career in his own words: “I was born and raised in Regina, Saskatchewan and have lived all of my life within a three block radius of one spot. I have worked all of my career in the same building doing the same job. I was born into a printing shop and this is the only money making job that I have ever had. I did have lots of hobbies, but mostly in small wood working shop mode. And this woodworking was all for fun. I made a very large number of wood boxes and foot stools. No reason for this, or any need. I just liked making boxes and wood bobbins for the storage of electrical extension cords. I had more extension cords than anyone that I ever met. I have travelled to Europe once. I did not like it. I bought pretty much all of the Ludlow equipment that I ever had a chance so to do. I really, really like being a printer. My health is now very poor. I am very frail. I can be “outside my home,” for only about 5 hours a day now. I do like writing and setting type, and I still upon occasion fire up one of my Ludlows and cast a few lines of type for demonstration purposes. Two weeks ago I was asked by one of our local “arts groups,” to deliver a public lecture and demonstration on Letterpress Printing; I was so proud and happy to do this, particularly as this was the first time in my life that this has been asked of me. I am definitely one of the last of the “old guys,” in our area and am well versed in owning and operating a Letterpress Shop doing commercial printing for the public. I did do a bit of artsy type printing. I particularly like printing poetry and prayer broadsides. If you have a printing question for Phil please leave it in the comments, and I shall pass it on to him. Oh my, Phil is one of a dying breed: a true gentleman printer. I have several of his lovely mitzvah gifts, in their beautifully handcrafted boxes. They, and he, are treasures. I would love to sit at his feet and listen. Rebecca Everett Birdwood Press, formerly Magnolia House Press.